I started a new legacy-type game today. My aim is to complete every self-employed job/rabbithole career/profession available in the game, hence "Workaholics". 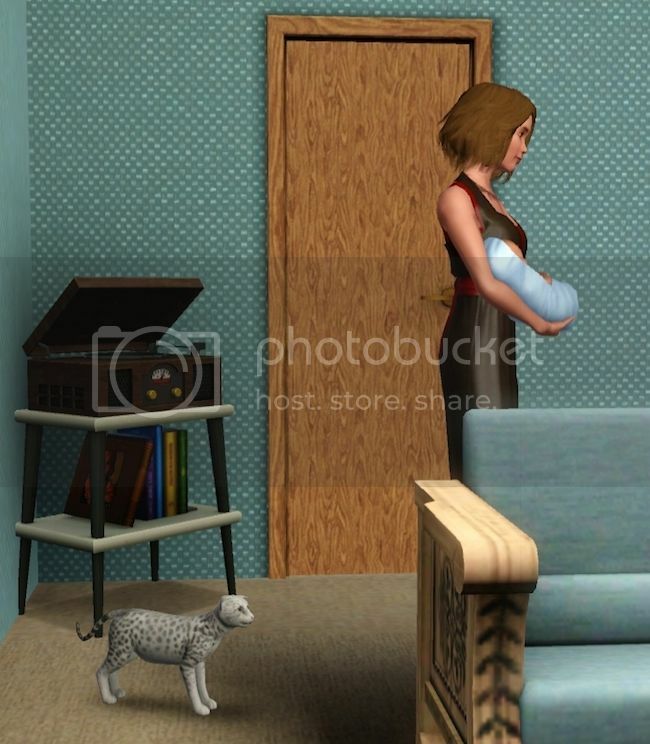 Along the way I will set some relevant challenges for the sims in each generation but nothing too serious. No scoring or draconian rules. I'm tired of doing serious in RL at the moment - this is just for a laugh and a distraction. The only rule I'm imposing on myself is that I will allow the selection of two traits per heir, so that I can choose some things specific to their career, but the other traits will be randomised rolls of the dice and I will just have to put up with whatever silly traits the game assigns. That should stop me always picking the same ones! 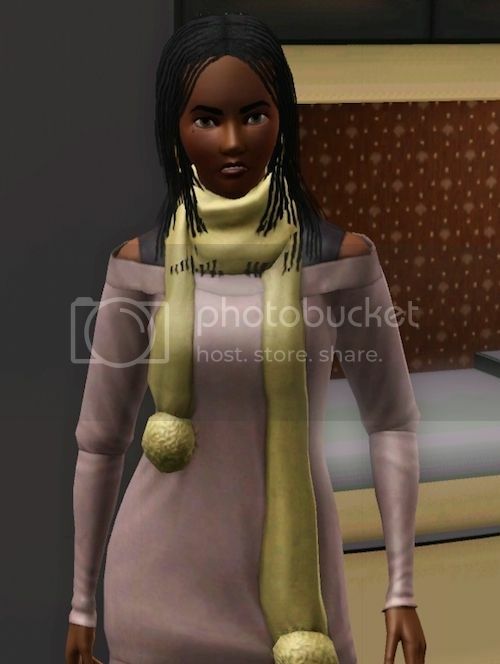 The only exception to this will be the founder sim, as she is already made and her personality is fixed in my mind since TS2 and cannot possibly be changed at this late stage. 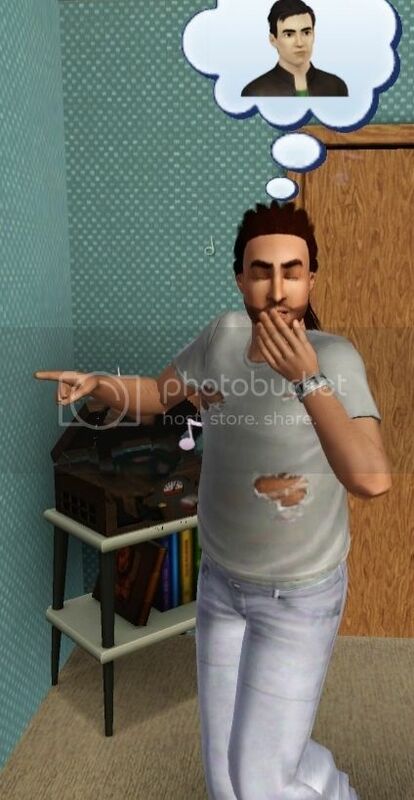 You may (or may not) be glad to hear that the Sims Forums staff simselves have also been placed into the game, so for the first couple of generations at least I can see what they get up to unsupervised (frightening things, I predict). Here is the lovely Vanessa. She and I have been playing Sims together for many years now - about a decade! She's a bit of a rock chick and always has a lot of guys (and girls, actually) chasing after her. I decided she might like to start out in Lucky Palms. As well as being into music, she also happens to be a natural cook, so the first career to be completed will be the culinary career. That should be a nice gentle start. Extra culinary and life challenges for Vanessa will be (1) get an arts degree, (2) max out the most relevant skills to her career - cooking, gardening, fishing etc, (3) make an heir, that is quite an important one mustn't forget that!, (4) practise music because she really loves her guitar, (5) complete her LTW, which is 'Living in the Lap of Luxury', so she's going to need to get rich somehow, (6) learn all the recipes available. That should keep her busy. I wasted no time in getting her into the level one job down at the diner. 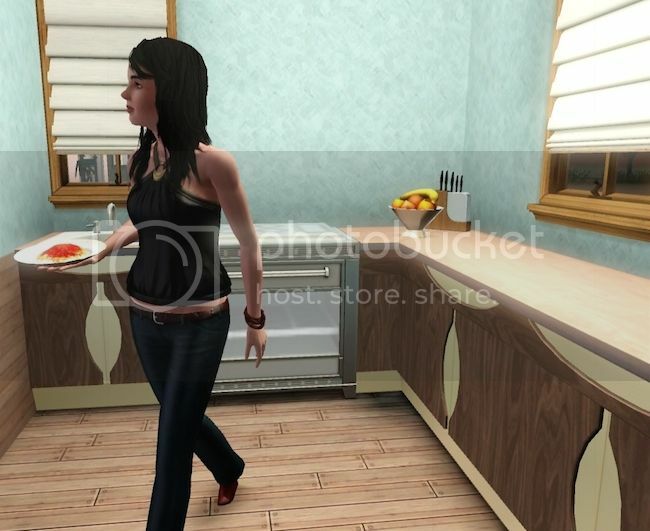 Her fridge started out totally empty (don't they normally have a bit of food in them at the start?) so I had her visit the community gardens to gather some ingredients and also make a start on her gardening skills. 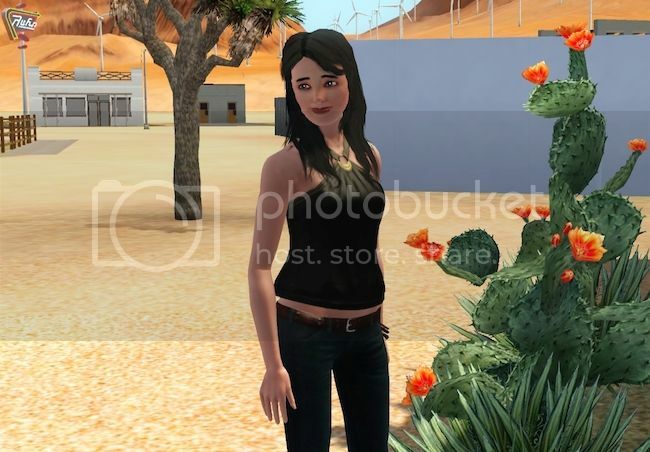 I need her to save up as much money as possible so she started out in one of the small starter homes in the abandoned-looking area of Lucky Palms. The not-so-lucky bit. 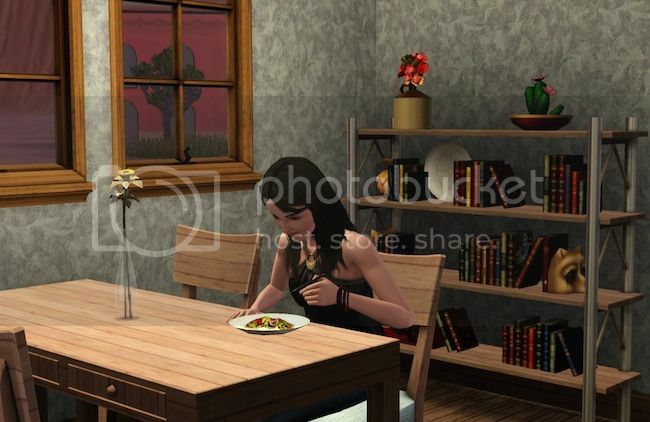 Since she'd harvested all those nice salad goods, that was all she had for dinner for a couple of days. Good thing it is salady summer weather. As well as trying her best to befriend her boss and colleagues, for career advancement purposes, I also made sure she bumped into the SF staff at an early stage. Here we are in our kitchen, eating pancakes as usual. We get through an inordinate amount of pancakes. Minty and Vanessa got along well and, as a fellow chef, Minty was pleased to pass along some of his polenta preparation tips. "You have to whisk it like crazy!" Things didn't initially go well with getting to know Ollie. 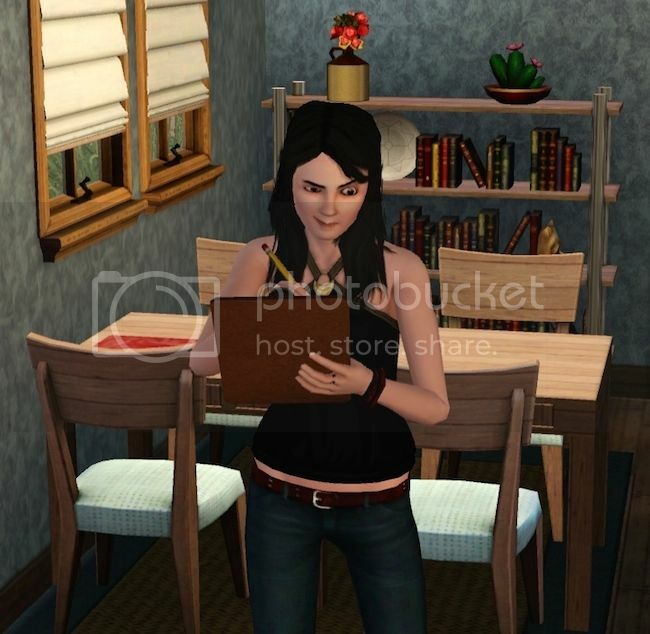 The newly updated Ollie is proper and a perfectionist and found Vanessa's casual dress to be an abomination. Presumably Caspin's inexplicably bare feet and pigtails were also upsetting him. He changed into a James Bond outfit and let them know how underdressed they were. Fortunately Caspin was able to lighten the mood, as well as keeping to the culinary topic, by cracking some jokes about turkey legs. OK then. I think they will all be firm friends after that. No, I am not speaking of Spain exiting the World Cup. I was quietly going about my business of sending Vanessa to and from her shifts at the diner and remodelling the interior of her little house, occasionally wandering over to the SF house to see if they were OK. I could see from the Story Progression notices that the boys, at least, were very busy. Very busy indeed. Every so often, Ollie would be dating some young lady or other. Minty, on the other hand, managed to get himself a very naughty reputation, apparently hell bent on dating every female in town. On several occasions I found him and Caspin indulging in some over-familiarity because they were both completely drunk, or 'juiced' as the game puts it. Nobody seemed safe from his advances, including the population's elders. I started to wonder if it was a cunning get-rich-quick scheme, as the old birds were dropping like flies and, as Grim took them away, Minty was inheriting some cash for his services! Then I spotted this and decided that he was simply practising the free love he must have learned at his choice of high school. Yes, that's right. It finally happened. Pretty lights in the sky. Ooooooh. Arrrrrrgh! Up you go, Mr Green! Good luck! 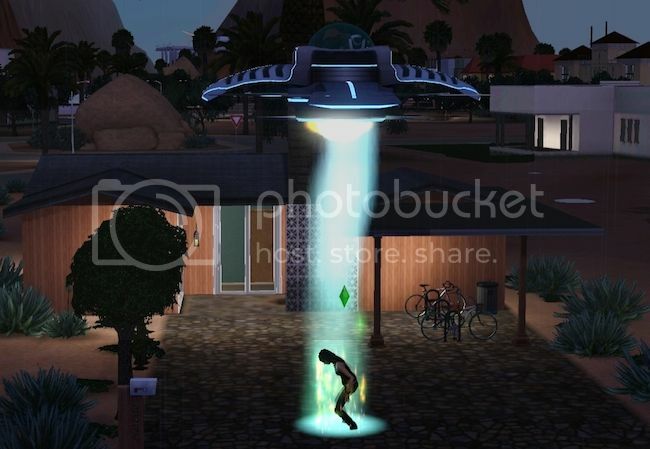 You know, I wanted Minty's sim to get abducted by aliens for sooooooo long and I could never get it to happen. 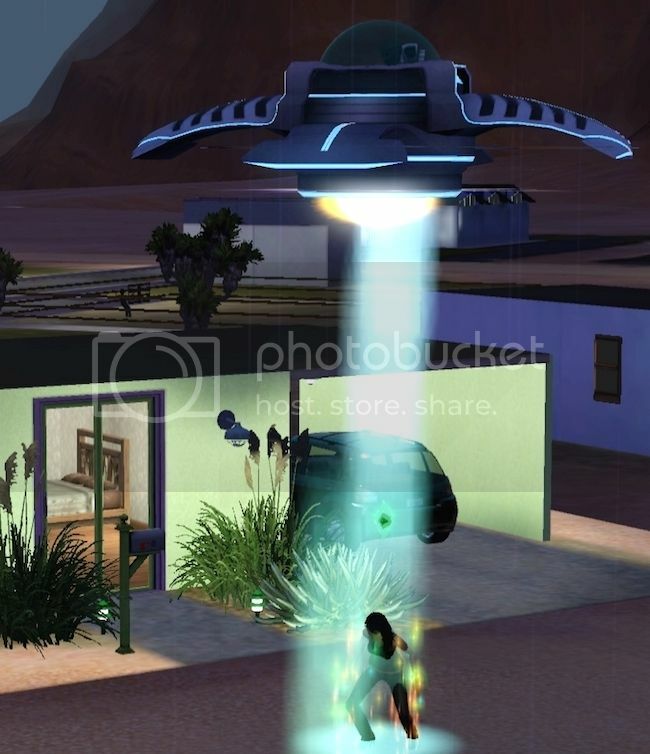 All the sims that were abducted were always girls. Vanessa has been abducted a ludicrous number of times. But now, when I was least expecting it, off he goes for his probing. And I was really distressed and wanted those aliens to put him back on the ground! I have no idea if his little green friends managed to impregnate him with a little green friend. We shall see! Another day off for me means another day of work for Vanessa. Better her than me, hey! Something weird is going on with the aliens in this game. They just cannot keep away! 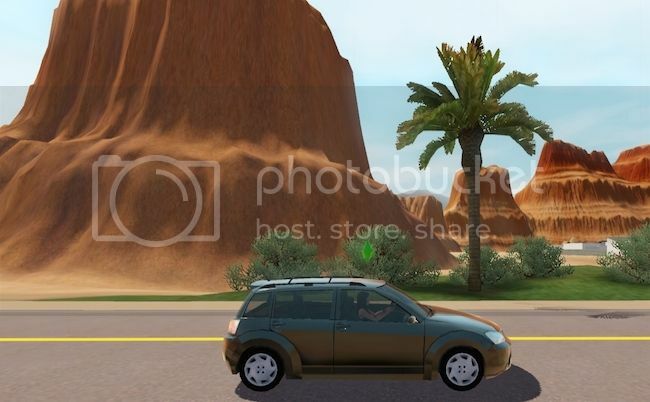 Is Lucky Palms set up to attract a higher rate of abductions than other towns? Vanessa was taken up twice, once during a party at our house and then again the next night at her own house. It's getting a little ridiculous. No sign of any alien pregnancy either. Damn! Poor Minty got probed for nothing. That must be a bitter disappointment. Vanessa has been working her way up at the diner, I think she's level 3 now, as well as the usual relaxing simming pursuits around town. She must have befriended a few celebrities along the way (or maybe she is now famous for alien liaison?) as we are followed by the bloody paparazzi at all hours. Unfortunately he really wouldn't shut up about his worm and was impossibly dull to talk to, so we abandoned that scheme. I preferred him, however, to his replacements. This double-act did some serious peeping through the windows, creepily staring through while Vanessa was getting into bed. Urgh! Me thinks they shall be deleted. 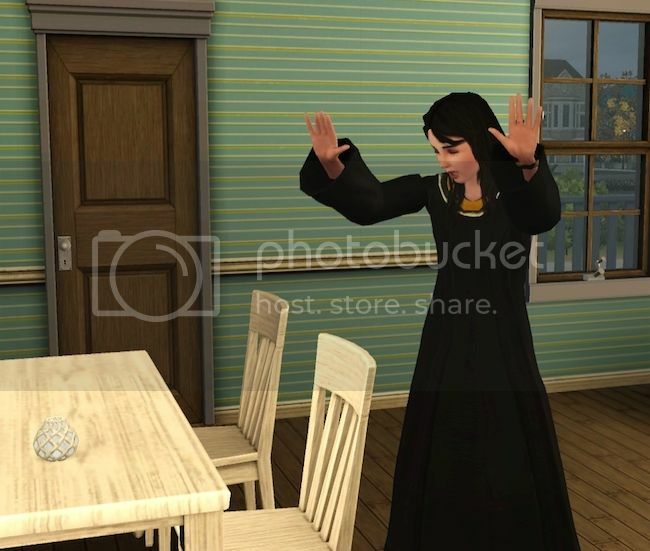 Vanessa was invited to Caspin's party and headed over there to find this young lady lurking outside in the dark. It's Ollie's girlfriend! Things are going swimmingly for Miss King and Ollie. 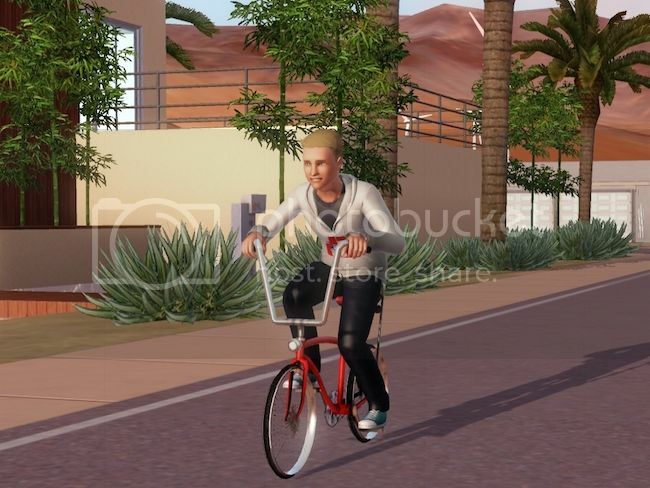 Mind you, he does look quite pleased, doesn't he, zooming around town on his new bike with a big grin on his face. Vanessa discovered something else while at the party - it wasn't so much a party as a plea for help from the Sims Forums household, which appears to have been turned into the refuge for abandoned sims! Caspin was found in charge of a young unwed mother, plus the baby and a cat. The house really isn't big enough for all these folk! No wonder Ollie is always out visiting his girlfriend, it's probably better to be out with her than at home at the moment! Vanessa kindly gave them a bit of help, grooming the cat and feeding the baby. The young mother seemed totally out of it and was asleep on a sofa most of the time. It's a rather sad state of affairs! It is all this guy's fault - yes, you, in the shirt full of holes! 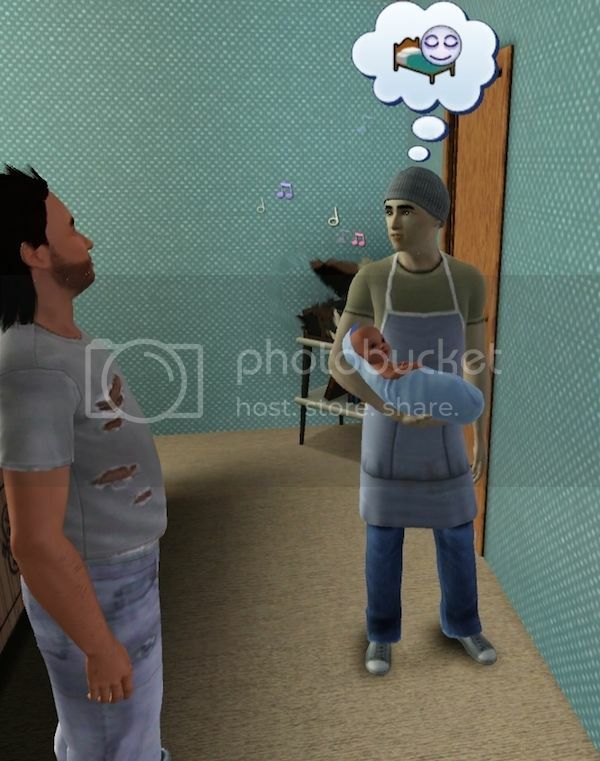 Minty came home tired from his shift at the restaurant and suggested to this "man" that he might like to look after his child while the refuge staff got some kip. The guy is a total loser and refuses to pay his child support (or bathe, by the look of things). Clearly he thinks it much more fun to dump his offspring onto another household. Well. I'll show him! I'll get my alien friends to probe you good and proper! Do not fear for the SF house, though. 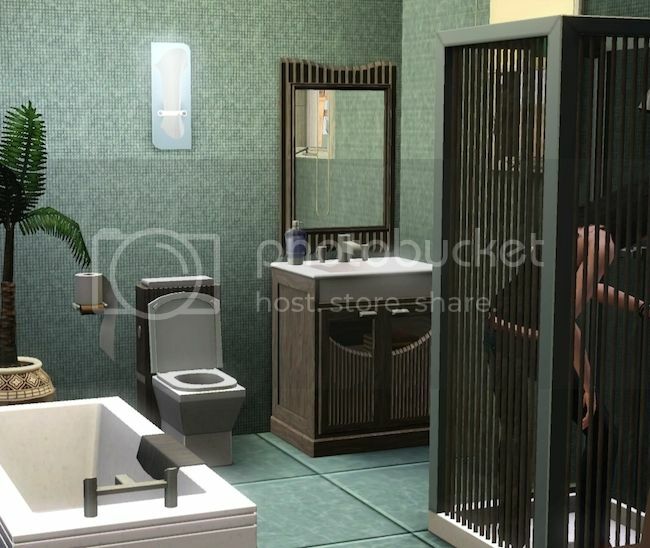 I did a bit of tinkering and was able to re-house the excess sims in a much larger, richer house in town. They should be all right there. Meanwhile, this guy, Lennon Sosa, works with Vanessa at the diner and is constantly flirting with her and sending her gifts. He's a bit of a dish to look at, but a complete prat to talk to. He is also the father of most of the babies in town from what I can tell! Seeing as the paparazzo didn't really work out, Vanessa agreed to go out with Lennon. Well, she's not looking for marriage, just an heir will suffice. They chose to go the summer festival for their date, so naturally it started raining and then hail pelted them. Isn't it always the way. There was some sense of guilt on Vanessa's part, as she knew Lennon was married, but since everyone else in Lucky Palms is up to no good, she figured she might as well have her share of the fun. Back at Vanessa's house, Lennon lost no time in making a move. Jeez, what an obnoxious moron he turned out to be. And unfortunately we had seen his best moves earlier. Sorry, Vanessa. He seemed quite pleased with his performance. Vanessa - less so. Her face says it all. No baby jingle music either, so there may need to be a repeat. So sorry. 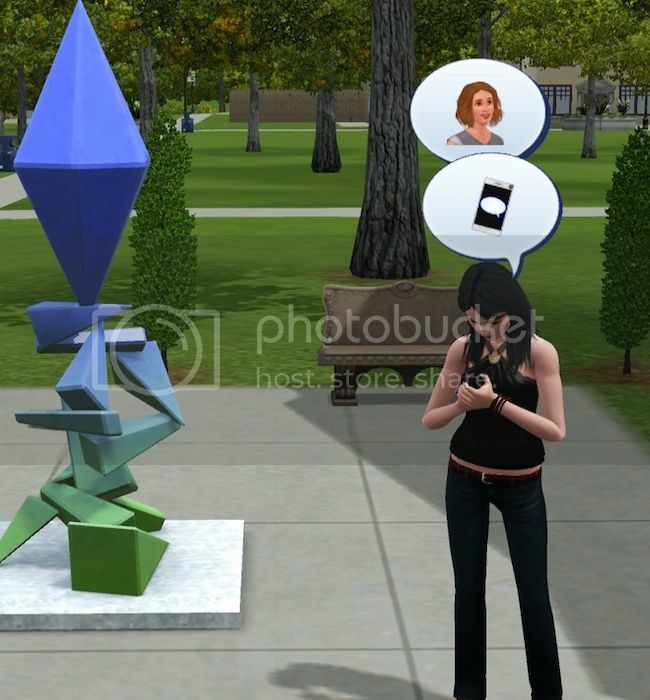 I like this idea, getting your Sim to try all the self-employed careers. Rain in Lucky Palms looks so weird! I really wish there were more options to organise the weather. I hate it when it snows in summer or you get these out-of-season weathers far too often. It always rains during my summer festivals! I have in fact turned off hail and fog now, as they just didn't suit Lucky Palms at all. I've left the rain on and the snow, but I've made Summer and Spring twice as long as Autumn and Winter. That should make it look a bit more sensible. Vanessa's old boss died and, since they'd also been good friends, left her a little money in her will. This was enormously helpful! 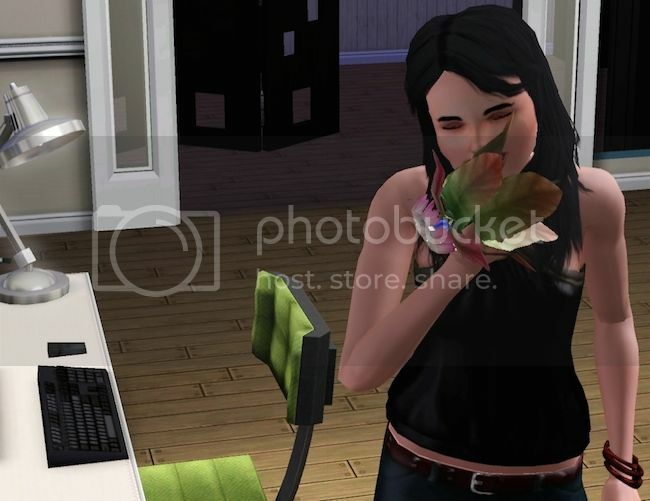 Vanessa put it to good use, doing up the house and buying some fun objects. 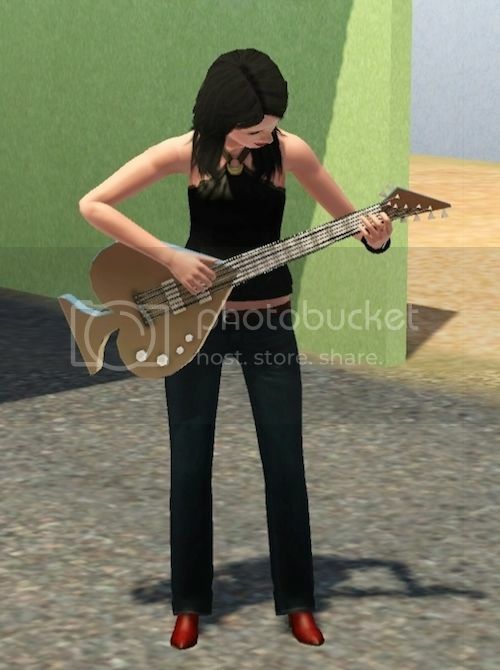 A shiny new guitar was first on her wish list. I thought this funny-shaped one fitted quite well. 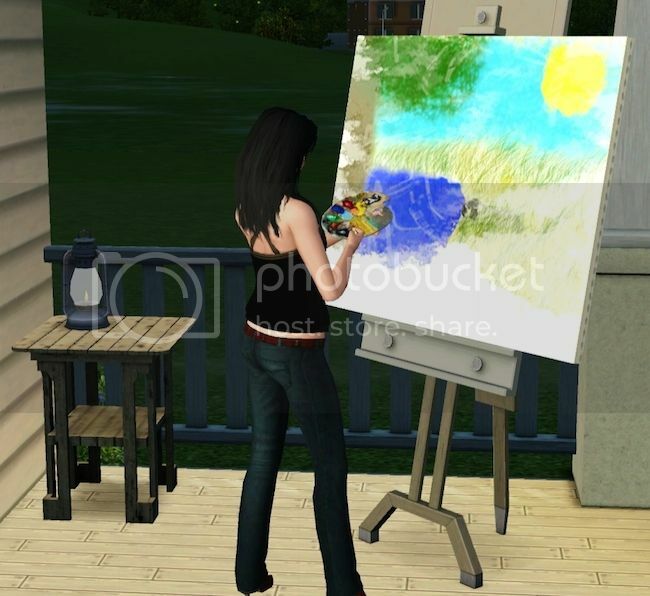 She really needs to make more money if she is ever going to complete her LTW to be rich so I also bought her an easel and set it up at the back of the house where she has a fine view of the mountains and palm trees for inspiration. I refitted her bathroom - no more cold showers - and Vanessa spent some time making all the new appliances self-cleaning. That will improve her life no end! In the kitchen we fitted some more attractive cupboards and bought a better quality stove for greatly improved spaghetti. Another great way to make some extra cash, I thought, would be to write a few books, so a rather colourful new laptop was purchased. Seeing as she's a chef, Vanessa will be writing cookbooks I think. I also got some new blinds for the windows to prevent those awful paparazzi staring in at her. And finally, quite a big purchase - a shiny new car so she can zip around town and no longer be overtaken by children on bicycles! It's not really her style but it'll do for now. With summer nearly drawing to a close, Vanessa tried to make the most of the fine weather, going for lots of days out around town with her friends. I was rather alarmed to see this person in the park. What is going on there, with her futuristic trousers and medieval shirt?! Something of a styling failure. Oh well! I also noticed that all of the toddlers and many of the children in town were bald, so some hairstyles had to be manually applied. Weird. 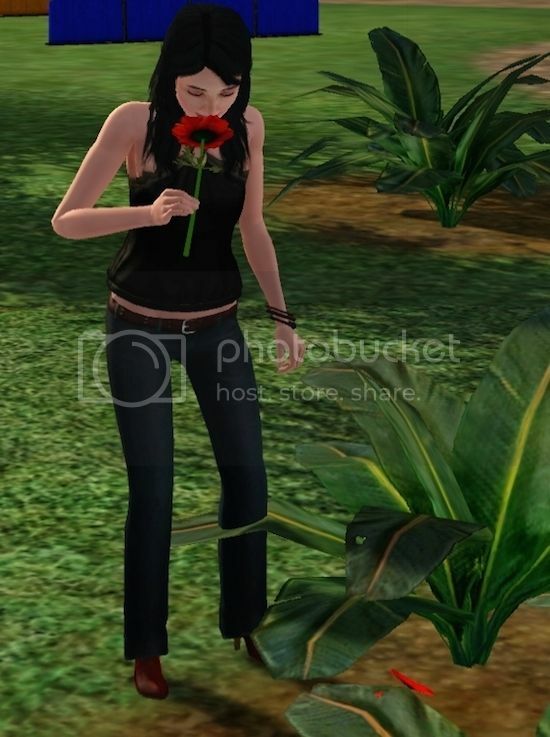 Picking flowers at the festival park is a great way of making money. I had little sympathy for her sneezing her head off from all that pollen, given that that's all I'm doing myself at the moment. I really do need her to get rich more quickly - I want a house with a pool! And so summer drew to a close. The alien abductions continue to occur every few nights. 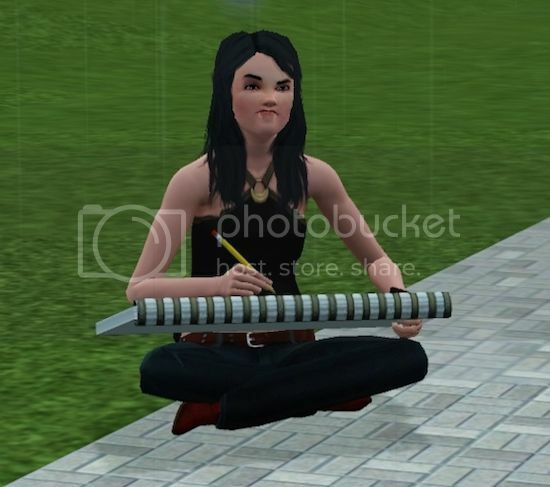 I mean, come on, these sims have got to be a bit sore by now, right?! They are not making any friends, that's for sure. I wish you could fight the aliens off, like you can try to tackle a burglar or put out your own fire. 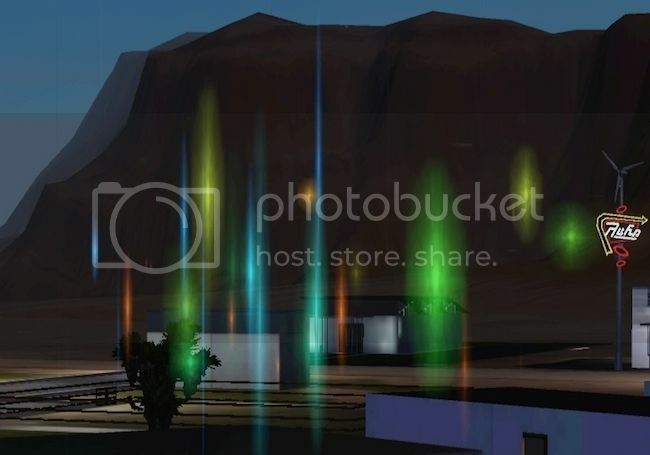 Who would just wander outside to look at those colourful lights after six probings in a row? You know where it's going to end! After a short break from dating, Vanessa went to a party and met up there with Lennon, who was keen to rekindle their romance. Maybe he's learned a few tricks from his liaisons around town (or perhaps Minty and Ollie sat him down man-to-man to tell him how it's done, with all their extensive experience with the ladies of Lucky Palms! ), as Vanessa seemed fairly interested in him this time. Unfortunately he might be a handsome devil but he's not too smart, flirting away right in front of his affronted wife. Sorry, Martina. Martina has now declared Vanessa to be her enemy, so I anticipate some trash can kicking and aggressive behaviour from her. What a shame! We've invested too much time in Lennon now, though, he's going to have to come up with the heir-making goods and Martina will just have to cope with yet another humiliation. Vanessa, on the other hand, was awarded a moodlet I've never seen before as a reward for being faithful to the faithless Lennon! Time to get out of town for a while, I think. Vanessa wants a fine art degree, so set about taking the aptitude test. She did pretty well on the test (good girl) so now she's off to university for a term of studying and partying. Let's hope she doesn't put her back out doing keg stands or spend tooooo much time streaking. She certainly seems happy in university town. 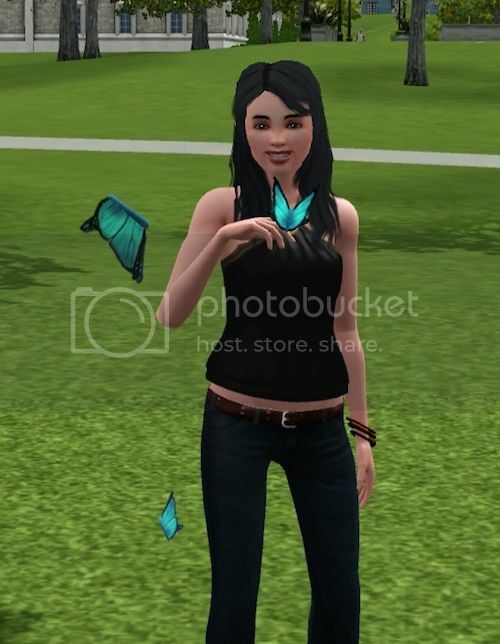 I've loaded her up with a very full timetable to try to get a big chunk of the degree done, but there is always time to catch a few butterflies. The aliens have halted their abductions, but still visit in the night, lurking in the bushes outside her student house. They're as creepy as the paparazzi! I think I filled up her timetable too much, as poor Vanessa had trouble getting to all her classes. It just takes so long to move between the different buildings on foot. I might get a hoverboard from the future and see if that works on footpaths! 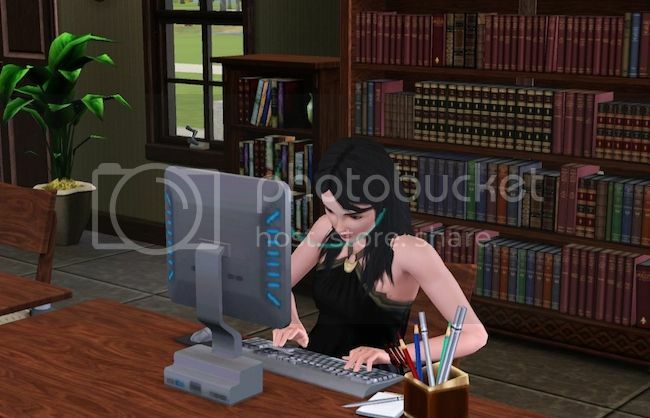 Fortunately, with it being an arts degree, she was able to catch up on her work at home and have fun at the same time. 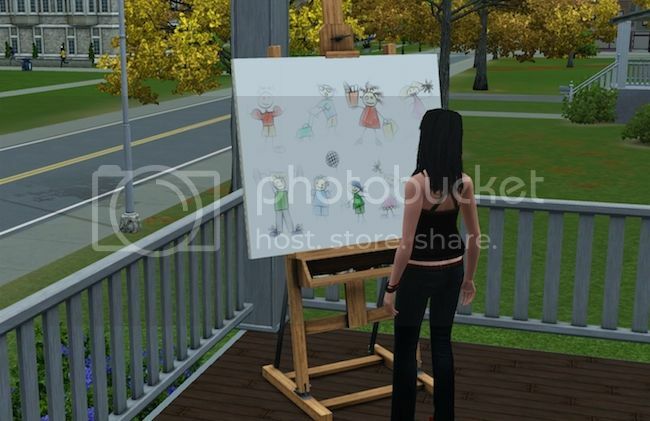 Yup, really advanced-looking painting there, V.
Better to use the easel on the veranda of the house than attempt to attend the stupid art class. Much like the summer festival, any sort of outdoor lesson immediately signals rainfall. Yay, let's sit in a puddle for two hours and make sketches that don't even sell for much. Super. I was pleased to see that even though she was away at university, she didn't forget her maker. All that sketching paid off and she managed to get great grades. That's my girl! After classes finished I tried to collect lots of herbs and seeds as there are so many interesting ones to try. It is unfortunate that she did not eat the "wonderpetal" before her exams, given that it gives you nine ours of studiousness and good mood! Noted that for next term. Oh well, after all that hard work there was time for a night out before heading back to Lucky Palms. HA! 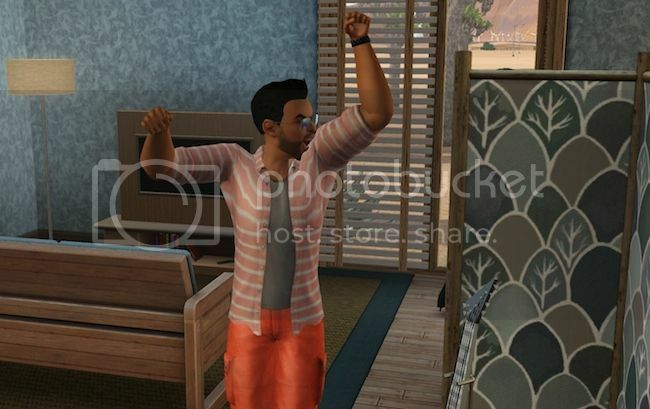 This is hilarious and I love how you incorporated all of your Simmer buddies! Sometimes, a good, lighthearted legacy is exactly what one needs to brighten their day, and you have certainly brightened mine. 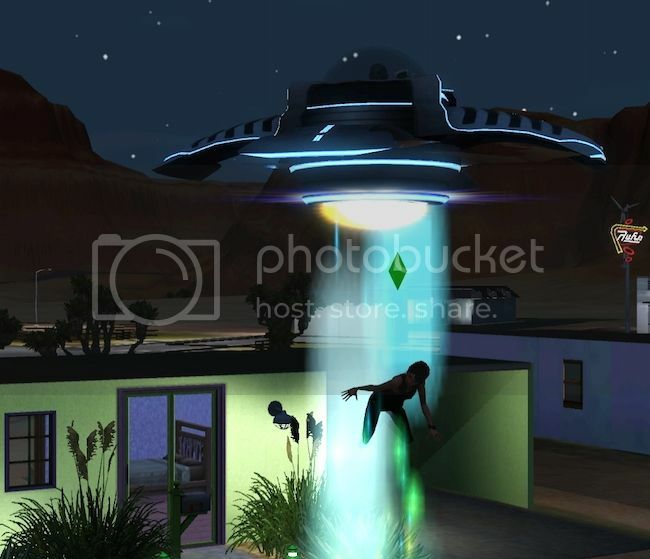 *Ugh, lucky, I have YET to have a male Sim abducted by aliens! No matter what I do, it never happens. 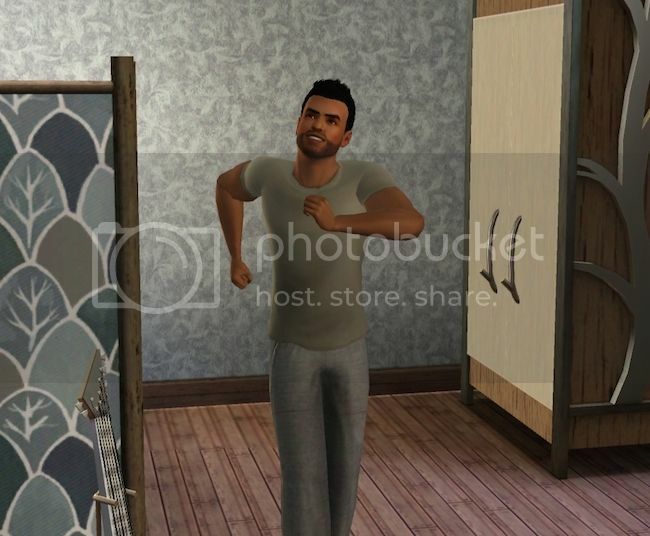 Aw yes I find it hilarious having our boys' simselves in my game. 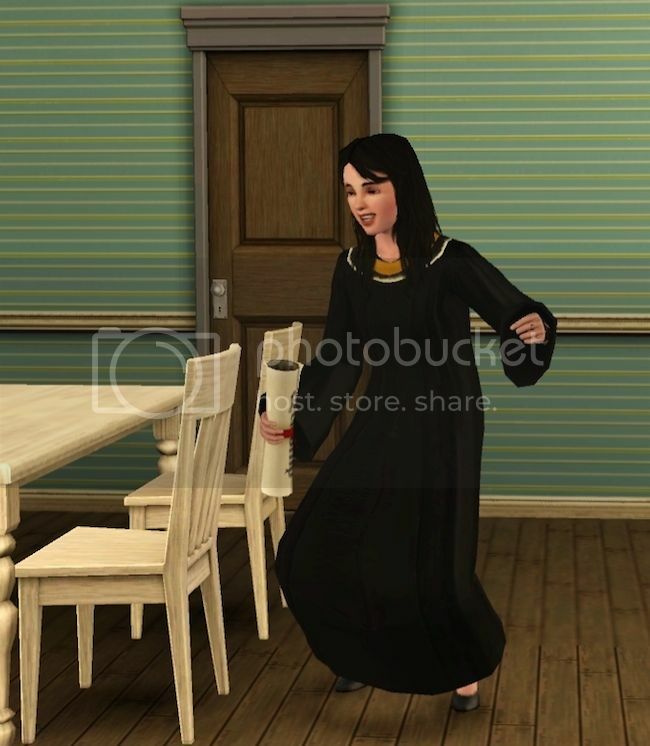 They are very entertaining sims (or maybe that's just the way I play 'em). I read that to increase the chances of alien abduction you should get lots of space rocks. I tried that many times in a variety of worlds to no avail. Whereas in Lucky Palms I seem unable to move an inch for the number of spacecraft bearing down on my sims! Hm... Perhaps that's why they call it "Lucky Palms." Both you and the aliens get lucky, ha! I tried the space rocks too. 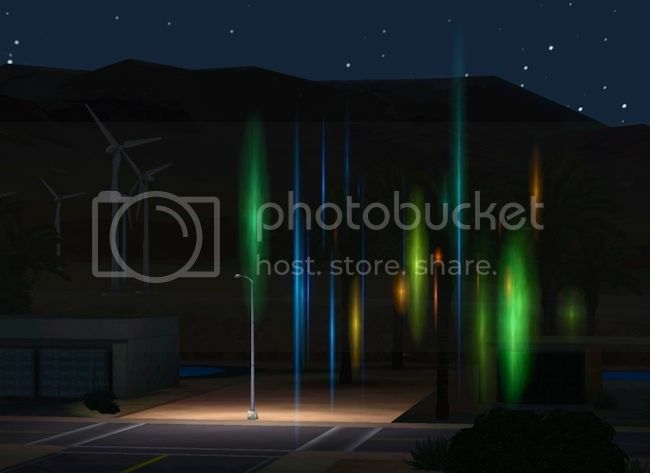 I had like 5 on my lawn at one time and the stupid aliens would walk around my yard in the middle of the night while my sims where asleep! Aha! 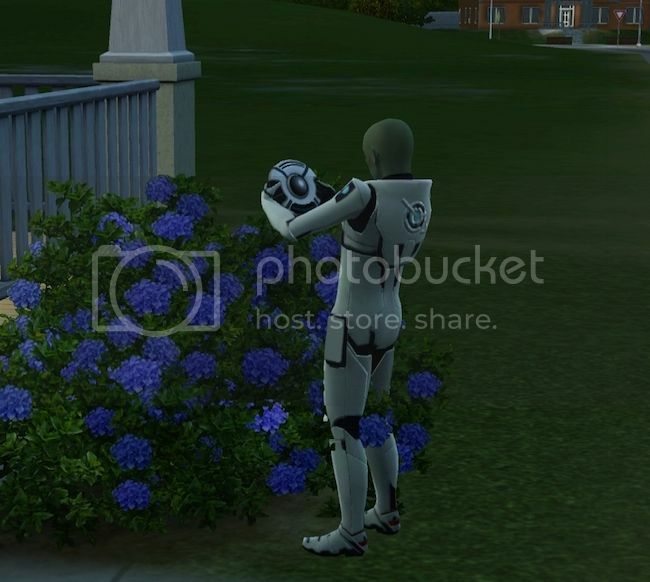 Perhaps you are on to something there - certainly all sims are trying to get lucky all the damned time! 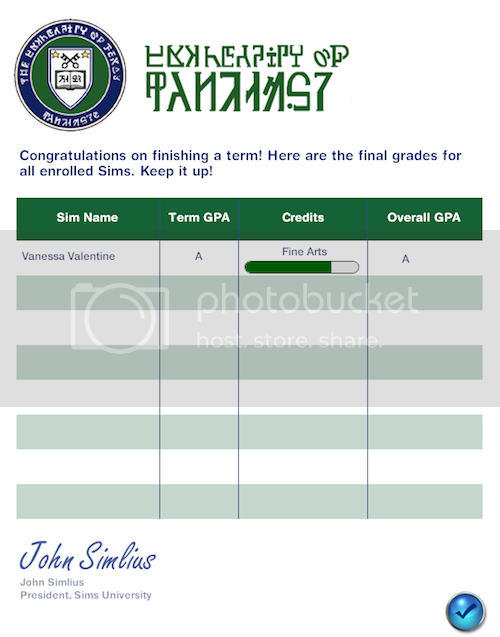 I sent Vanessa back to university for another term, which was enough for her to complete the Fine Art degree. They should have a Dark Arts degree for witches shouldn't they? Anyway, on the Art degree course it is quite easy to get a good grade as long as you do your own cooking and paint a few pictures. The rest of the time Vanessa spent multi-tasking other skills by sitting at the computer in the library and listening to tabcasts on her bluetoothy tablety thing, bought with the proceeds of her generous scholarship. She maxed out her cooking skill using this method, which is a great achievement for a chef. Now she can make lobster dinners for us all. 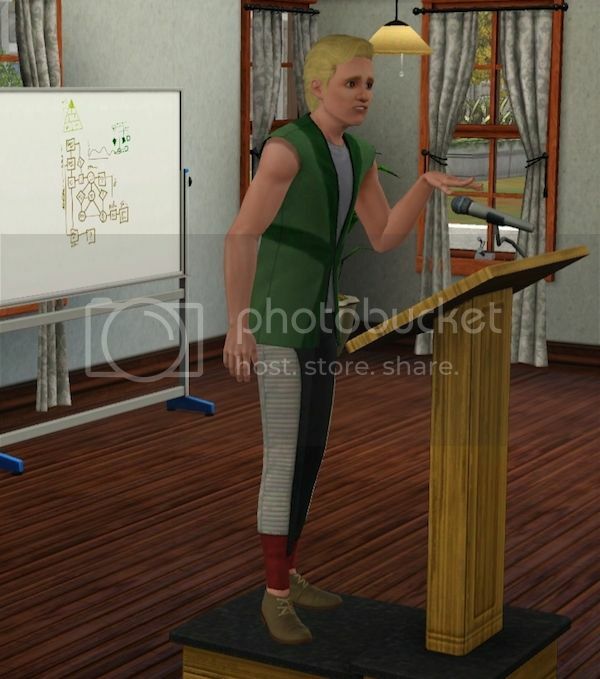 I made her attend the weekly lecture, which was presented by this unusually dressed gentleman. He left halfway through, inexplicably, but the class dutifully sat there for a further hour, sleeping on the desks, writing notes and raising their hands to ask questions of the now absent lecturer. Just bizarre. 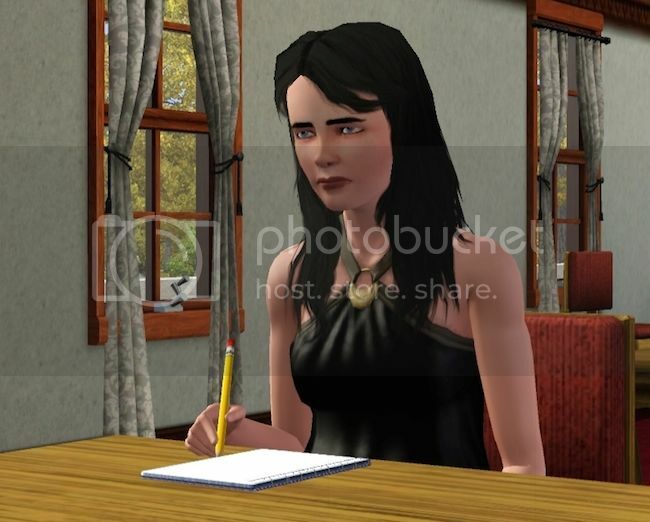 Vanessa was unimpressed at this waste of her time. It was almost as dull for her as the time I made her spend the night with Lennon Sosa. Sorry Vanessa. We gave up on formal teaching after that and just painted to get her academic bar to fill up. Look - she has drawn us all! Sweet! After a lengthy graduation ceremony, Vanessa finally received her scroll and conducted the obligatory "tossing the diploma", because obviously that's what it's for. I wouldn't attempt that with mine, which is in a frame, as it would no doubt take a chunk out of my head. Academic success had a rather odd effect on her, resulting in her channeling voices or something. Or did she feel a bit priestly in her robes? Don't know what is going on there, really. Time to go home and continue to work up that career ladder. 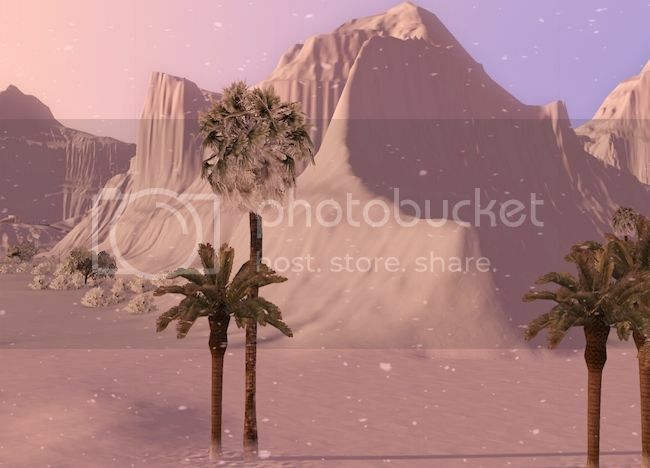 Lucky Palms looked odd in the rain but it looks even stranger in the snow. I like it though! While I was looking around the town at the snowy scenes I spotted Caspin walking around the streets, aimlessly trailing about with a silly smile on her face, daydreaming a lot of nonsense no doubt. 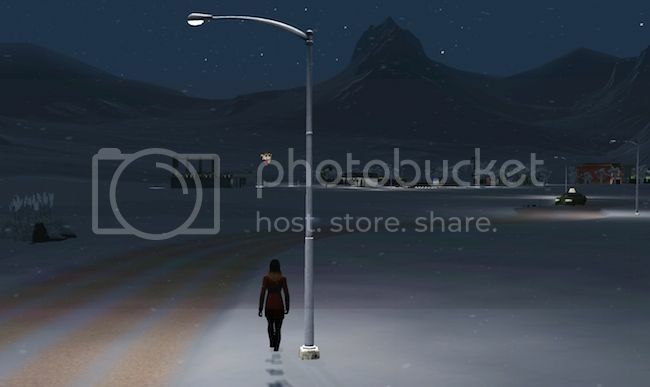 So I was looking around at the snow in Lucky Palms while my sim was looking around at the snow in Lucky Palms. Terrifying. I followed her for a while and she just kept on walking. Well that is enough of that for now.